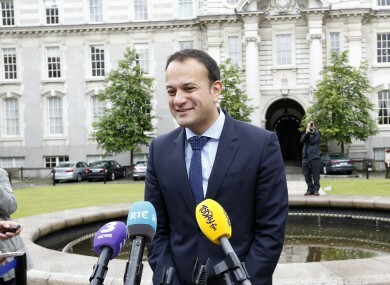 New Fine Gael leader Leo Varadkar speaking to the media at Government Buildings today. THE NEW FINE Gael leader has said he won’t be “best friends” with Fianna Fáil leader Micheál Martin, but is confident they can have a good working relationship. Following his meeting with Leo Varadkar yesterday, Martin said he had no reason not to trust the Social Protection Minister. “We have a confidence and supply agreement. We are both professional, large political parties – we both know how to do business. It is going to be possible to have a good working relationship. We are not going to be best friends, but we are certainly not going to be in coalition, but we are going to have good working relationship,” Varadkar told reporters this afternoon. Previously, Varadkar said he did not trust the Fianna Fáil party. Commenting yesterday, Martin said he is sure the new Fine Gael leader has said a few things in the past that he now regrets. What we have now is a new start and I am taking on a new role – assuming the vote goes okay next Wednesday… and when you start a new role I think it is an opportunity to start afresh and the meeting went very well. I am absolutely confident we can have a good working relationship, reflecting the fact that we are the party in government and they are the main party in opposition. Vardakar said he has been mulling over who should be in his new Cabinet, but said no decisions have been made. However, he did state there will be more disappointments than appointments for his colleagues. Varadkar made the point in his first press conference as leader last week that there would not be enough seats around the Cabinet table for his supporters, but the point was hammered home today. He told reporters today at Government Buildings that he has yet to select his new Cabinet, but did say the make up of it would be based on regionality, gender and trust. “Anyone who heads up a government, heads up a football team needs to know that everyone on that team is going to be fully behind your programme,” Varadkar said. Housing Minister Simon Coveney, who failed in his bid for the leadership, said on radio this week that he “hopes and expects” Health Minister Simon Harris to be in the new Cabinet, adding that he didn’t want any of his supporters’ careers to be damaged just because they supported him in the race. Varadkar said he would make his selection on the “basis of my assessment of what’s best for the country and the best people who should be in that”. He said he will make his choice based on people’s’ “ability” and “capability” to do the job. However, he was quick to point out that his supporters who might have been banking on a promotion should not be disheartened. There could be another opportunity around the corner. “There will be a reshuffle in 2019 after the local and European elections, so I hope that anyone that is disappointed doesn’t think they have lost out forever,” said Varadkar. He might be a little optimistic, as some are speculating there could be another election next year and another party in power. A place for Lucinda in the fold? Varadkar laughed off suggestions that he might like to see his friend and former Fine Gael colleague, Lucinda Creighton rejoin the party, replacing Dublin Bay South’s Kate O’Connell (who was a vocal Simon Coveney supporter during the contest). “Kate is a fine TD and I wouldn’t like to see her replaced under any circumstances,” he said heartily. The new leader has had a busy week of meetings with independents and Fianna Fáil in a bid to shore up their support ahead of the vote to be Taoiseach next week. The Social Protection Minister said he had yet to meet independent TD Michael Lowry, and said there has been no arrangement to meet yet. Last year, the former Fine Gael TD voted for Enda Kenny to be An Taoiseach. Kenny denied there was any special deal or promises given to Lowry in return for his support. Who is Michael Lowry and what’s everyone’s problem with him? Varadkar said today that he was unaware of any deal in place with Lowry. What do the independents want? In terms of the wants of independents and Fianna Fáil, he said they want some commitments in the programme for government expedited, while members of the Independent Alliance are seeking to avoid Cabinet collective decision-making on some issues, asking for a free vote on some matters. Varadkar said this can happen on occasion and will be decided upon on a case-by-case basis. Rural Independent TD Dr Michael Harty (who was a member of the Oireachtas Committee on Healthcare Reform) said he wants Varadkar to commit to implementing their ten-year plan for the health system. He said he was surprised to hear Varadkar had yet to read the report, but Varadkar told reporters today that he had read the executive summary and planned to read the full report this weekend. Because the proposed plan wants health spending to increase by €6 billion, Varadkar said he does not want to make commitments that he can’t deliver on. Email “Leo says he won't be 'best friends' with Micheál Martin but it's time to start afresh ”. Feedback on “Leo says he won't be 'best friends' with Micheál Martin but it's time to start afresh ”.